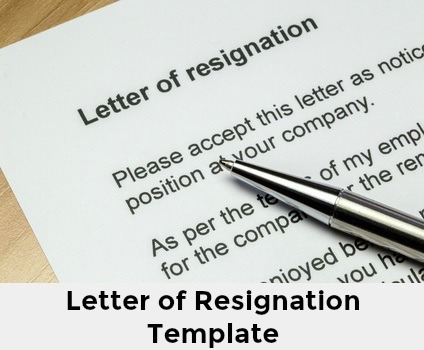 The letter of resignation template can be used to format your own proper resignation letter. Know what to include in your letter and how to leave your job in a professional and positive way. 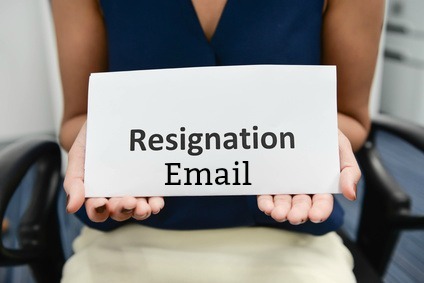 Whatever your reason for leaving, your resignation letter should not state anything negative about the company. Exiting your job on the right note ensures that you can rely on a positive employment reference from the company and your reputation as a good employee remains intact. Adapt this template for your own purposes. This letter is to notify you that I am resigning my position as Job Title with Company Name effective Full Date. In accordance with my contract of employment my last day of employment will be on Full Date. I have enjoyed my time here very much and I want to thank you and the department for the encouragement and support I have received. It is largely due to the excellent experience I gained working for this company that I am now able to pursue a new career opportunity. Please know that I am available to help in any way that will make my departure as smooth as possible for the company. I want to wish everyone the best of luck and success for the future. Writing a letter of resignation can be tough. You can customize the letter of resignation template by using any of these key phrases in you resignation letter. The time spent at XYZ Company has been both professionally and personally rewarding. I sincerely appreciate the support and guidance I have received. I have thoroughly enjoyed the work environment and appreciate the opportunities the company has given me. It is with sadness that I leave XYZ Company and the wonderful team I have worked with. After much consideration I have decided to move into a new job that supports my future career goals. This has been a difficult decision but I have accepted a job which will further advance my career. I have been offered a new challenge and after much deliberation I have accepted. I will do all I can during my notice period to make my departure as easy as possible for the company. Please be assured that I will put all my efforts into the smooth transfer of my responsibilities before leaving. I regret any inconvenience my resignation may cause and I plan to do all I can to help with the transfer of my duties. Make sure you have addressed the letter to the right person. Ask Human Resources if you are not sure who this is. Get the correct spelling of the person's name and job title. Ensure you have provided the correct notice period as stated in your employment contract. Do not use your resignation letter as an opportunity to tell the employer what you would change about the company. It is better to leave on a positive and friendly note. Your resignation letter will be kept on file and is likely to be referred to when your ex-employer is contacted for a reference. Find out more about requesting job references here. Use the essential resignation checklist to make sure you exit the company with everything in order. Looking for a resignation letter sample to help you complete the letter of resignation template? These free resignation letters can be personalized for your own use.